Background: The incidence of lung cancers has increased globally. Increased exposure to tobacco, passive smoking, less consumption of vegetables and fruits and occupational exposure to asbestos, arsenic and chromium are the main risk factors. The pathophysiology of lung cancer is complex and not well understood. Various microRNAs, genes and pathways are associated with lung cancers. The genes involved in lung cancers produce proteins involved in cell growth, differentiation, different cell cycles, apoptosis, immune modulation, tumor spread and progression. The Hippo pathway (also known as the Salvador-Warts-Hippo pathway) is the latest emerging concept in cancers. The Hippo pathway plays an important role in controlling the size of the tissue and organ by virtue of its action on cell proliferation and apoptosis. Objective: In the present review, we highlight the mammalian Hippo pathway, role of its core members, its upstream regulators, downstream effectors and the resistance cases in lung cancers. Results: Specific interaction of Mer with cell surface hyaluronan receptor CD44 is vital in cell contact inhibition, thereby activating Hippo pathway. 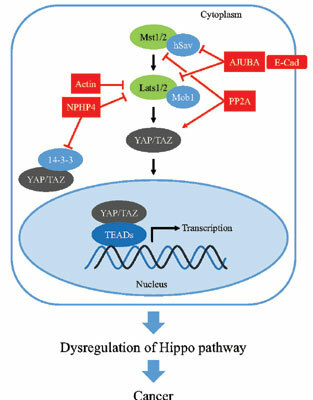 Both transcription co-activators YAP and TAZ (also known as WWTR1, being homologs of Drosophila Yki) are important regulators of proliferation and apoptosis, and serve as major downstream effectors of the Hippo pathway. Mutation of NF2, the upstream regulator of Hippo pathway is linked to the cancers. Conclusion: Targeting YAP and TAZ may be important for future drug delivery and treatment. Keywords: Cell proliferation, apoptosis, hippo pathway, lung cancer, genes, drug delivery. Keywords:Cell proliferation, apoptosis, hippo pathway, lung cancer, genes, drug delivery. Abstract:Background: The incidence of lung cancers has increased globally. Increased exposure to tobacco, passive smoking, less consumption of vegetables and fruits and occupational exposure to asbestos, arsenic and chromium are the main risk factors. The pathophysiology of lung cancer is complex and not well understood. Various microRNAs, genes and pathways are associated with lung cancers. The genes involved in lung cancers produce proteins involved in cell growth, differentiation, different cell cycles, apoptosis, immune modulation, tumor spread and progression. The Hippo pathway (also known as the Salvador-Warts-Hippo pathway) is the latest emerging concept in cancers. The Hippo pathway plays an important role in controlling the size of the tissue and organ by virtue of its action on cell proliferation and apoptosis.